Much to the relief of everyone who keeps on asking me, wedding sewing is underway. Just. As I keep on trying to tell people, I’m not worried. I know how long it takes me to sew things and even though it’s 80 days until “I do”, it’ll all be fine. To be honest, we’ve been so focused on all the other wedding stuff, the sewing has been a little ignored. 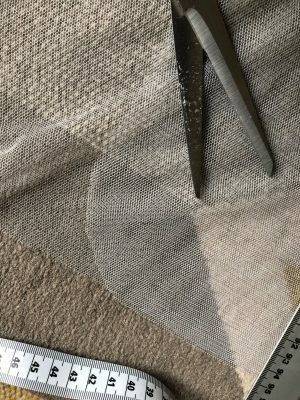 The first thing I made was my hen party veil, so I thought I’d share a little step-by-step tutorial on how I did that. Each to their own and all that, but the idea of a tacky hen party complete with L plates, questionably-shaped straws and strippers is my idea of absolute hell. I’m having a meal and drinks one weekend with friends and relatives and then having a quiet couple of nights away with my closest friends the week after. Much more my kind of thing. I still wanted to wear something hen party-ish and so I liked the idea of a hen party veil. Plus, I figured it’d be a practise run for making my actual veil. 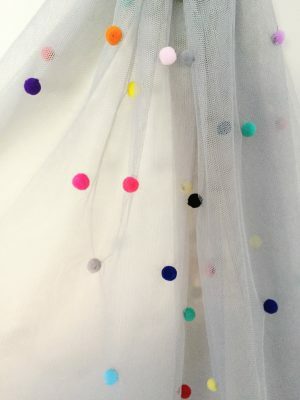 I decided to go for grey tulle covered with pom poms and I’m really happy with how it turned out. 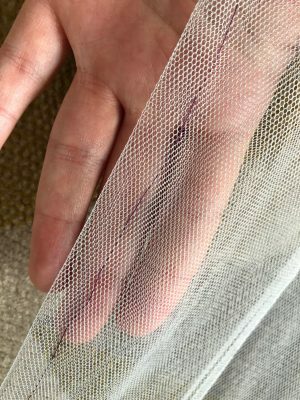 It was crazy easy to do (even if you’re not great at sewing, you could do this) and it makes me wonder how bridal shops can charge so much for veils. That’s it! No sewing machine needed. 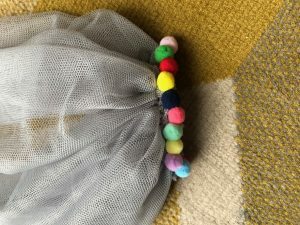 I bought my tulle, comb and pom poms from eBay and it all came to about £5. 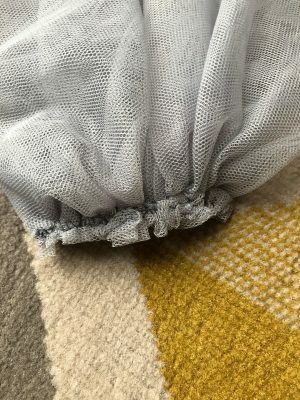 The great thing about tulle is that it doesn’t fray, so no hemming required. Of course, you could sew a ribbon trim around the edges, but you can just leave it plain. I realised that 1 metre of tulle was more than I needed. I wanted my veil to be double layered and fall somewhere between my shoulders and elbow. I’m sure the excess will get used for something though! To work out how much I needed to cut off, I literally folded it in two and held it up against my head. It’s not something that needs to be too accurate! After I trimmed some of the length off, I folded it in two with one side longer than the other. 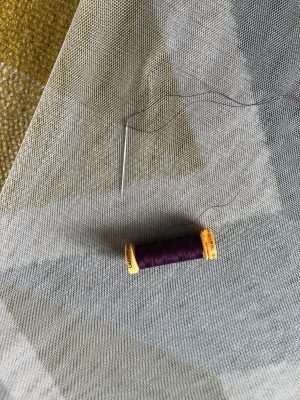 Now comes the only bit of sewing you really need to do. Trust me, it’s easy. Along the folded edge, about half a centimetre in, I used a contrasting colour thread to sew long stitches. Make sure you leave a length of thread at each end, without knotting it, so that you can gather the tulle easily. 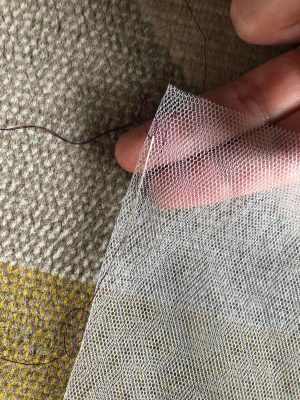 To gather the tulle, just pull gently on one end of the thread and move the tulle along. Easy peasy! This is the part that took the longest (and still didn’t take very long) because I did sew the tulle to my comb. You can probably get away with using some strong glue, but I didn’t because I wanted to make sure the comb stayed put! 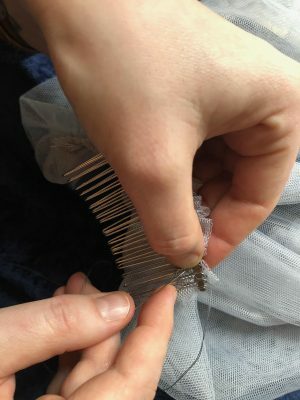 I gathered the tulle to the width of my comb, made sure the comb was the right way around and then stitched it on. To be honest, there was probably a neater way of doing this, but I wasn’t so bothered as I wanted to add pompoms along the comb. Another thing you could do to hide any un-neatness is glue a bit of ribbon over the edge. 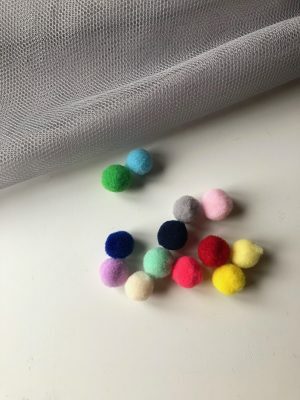 I wanted to add tiny pom poms to my hen party veil for a bit of colour and, really, who doesn’t love pompoms? You could add sequins, or lace or anything really. Can’t sew? 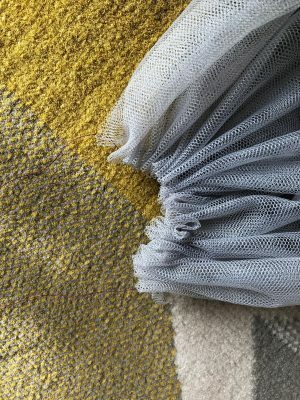 Then fabric glue is your friend here. I did choose to sew my pom poms on. Again, this was just so I knew they wouldn’t come off! Firstly, I sewed pompoms along the comb, to jazz it up a bit and hide the edge of the tulle. All I did was bring the needle up through the centre of the pompom and then did a couple of little stitches. I sewed the pompoms on the veil in the same way, but only through the top layer of tulle. 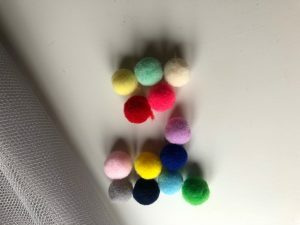 You could definitely glue the pompoms on instead if you don’t want to do any sewing. How easy was that?! Whether you’re making a hen party veil or a wedding day veil, the basic instructions are the same. All that really changes is the length and embellishments you choose to use. 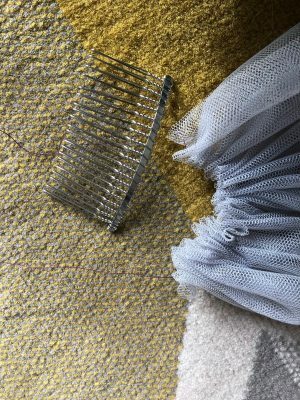 You can even buy combs that already have a bit of sparkle on to make it even easier.